Komi is 6.5 for this game. 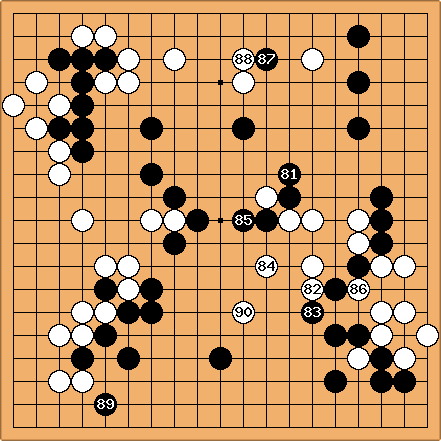 Discussion of moves in /Discussion. Please play on one team only. Game over. W+7.5, great job White! Review of the game in /Review. : Andy: Hey, I thought I saw jump off the bottom of the board. :) I'm moving again because wasn't exciting enough to constitute an entire move. : HolIgor: was sente, indeed. : herman: another 1 point gote. : Herman: Defending is mandatory here, and removes aji. Only dame are left, AFAICS. ThorAvaTahr: Did you mean deiri? : fractic: Another small sente. : Andy: I think this is ok.
: JoelR: Extending the whatsit. : JG: It is not really my turn, but someone has to play the yose or the game will never end. The chosen move should be safe. : fractic: I don't feel like playing this ko. : ThorAvaTahr: Hmm ok.. then how about I take this stone? : Andy: Sure, go ahead and take it. thanatos13 but it's not a reduction, I'm leaving two small ko threats for one point at j5. : fractic: Both sides have good follow ups after playing here. : Hylebos: Things are wrapping up nice and quick like. Huzzah. : fractic: Hard to pick a move right now. This looks big enough though. : tapir: Gote, but i hope big enough. : Andy: I hope this isn't aji keshi. 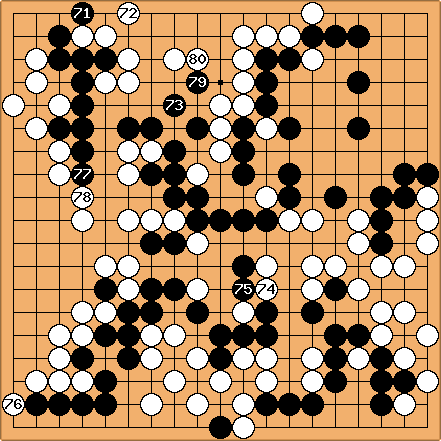 : thanatos13: I like this move. : Hylebos: I could play safely, but that would be boring. Lets see how black plays here. : JoelR: Black plays a boring move. : Andy: Take some chip shots over here now. : JG: It would be costly if B pushed through here. : JoelR: Maybe this is the biggest move. 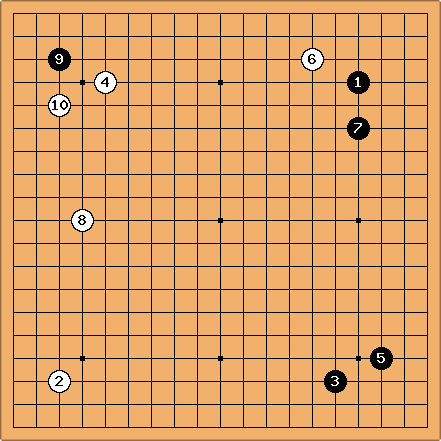 : thanatos13: looks fun, let's complicate things! : fractic: Let's just keep sente and be happy with that. : Ttoxcs? Let's see what your up to. : Tapir played this by basic instinct. : MrTenuki: Let's get something out of . : Hylebos: Nothing wrong with this move I suppose. : JoelR: Still dealing with . : ThorAvaTahr: There are many urgent moves, but I would like to get this one for black first. : Andy: I think this gets white at least a seki here. I would love for this to have been done in sente, but couldn't figure out a way. I think the game is close now. : fractic: is very big. Let's first finish this monkey jump here. : JoelR: Choosing among the forced moves. : HolIgor: Just to restart this. A self-demaging move. I hope it is sente, so black will have time to think how to respond to . : JoelR: This move was more fun before , but I still think it's big enough. : Andy: I can't help but feel white has used a sub-optimal move order here. : Celebrir: Defending against the cut. : HolIgor The result may be desastrous. : Andy: That'll do monkey; that'll do. : Celebrir: Taking the risk that the whole black team is going to kill me, I guess this move is the best one. But I have to admit that is a very painful for black. : JG: Cannot think of anything else. : JoelR: Too many cut points. really hurts. : Jay? : So basically white is down by (by my counting) 20+ points. This is a marginally risky invasion, probably should have gone deeper somewhere. : Celebrir: Joining the Black team, because it has less members and has to make a move. : JG: Not a tenuki. In the hope of finding out what meant. : Hylebos: A sente monkey's jump? Do my eyes decieve me? : fractic: Making some eyeshape while keeping an eye on the bottom. : JoelR: Solidifying the top. : HolIgor: Let's do some more fighting. : ThorAvaTahr: I will take the blame for not following up on , but I didn't know just how. This looks big as well, I would not like a white move in this area. : JG: So many places to play. Let's try some MutualDamage. : fractic: No way to avoid a game deciding fight now. : JG: It is hard to find a move. A leaning attack might work. : HolIgor: Keep on fighting. : Andy: just to keep things moving. : kb: I can almost put my foot in it! : JG: White is thicker than Black. Time to go all-out. : joelr: good stone to have in a fight. : fractic: Gotta keep cutting. : HolIgor: Accept the challenge. : JG: No-one else wants to play, so here goes. : HolIgor: Thinking of miai. : Joelr: I do feel crushed, and must respond. 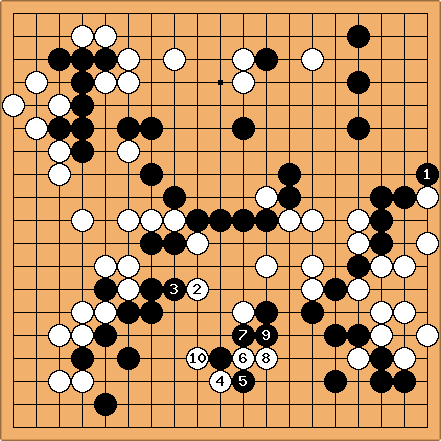 : JG: White has enough local strength for this move. : Hylebos: I get to make an easy move for once. Yay! : Andy: complicated. I think white can play this way because the ladder is good for her. I hope I didn't screw this up too badly. : kb: Atari -> extend. : JG: assumed this move is OK. Let's find out! : Joelr: Time to escape! : fractic: Time to capture this stone. : ThorAvaTahr: Although it seems to make the group heavy, I still like to play the solid connection. 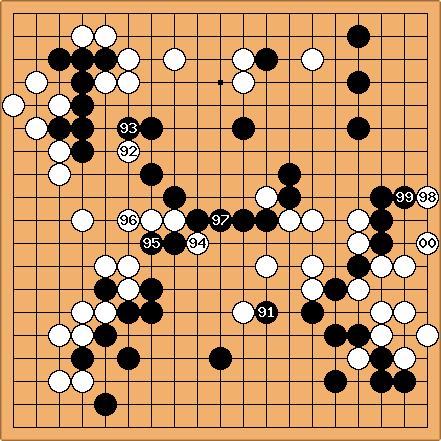 : Hylebos: I get the feeling that this game is going to be a bit tough for white. : kb: Don't like to break the one-move-per-board rule, but no one else is playing. : Tapir: Returning to the left. I'm not too confident with this move... but we will need some strength to deal with the white framework(s) later. : Andy: Just keep this simple for now. : HolIgor: It is difficult to play low now. Let's try keshi. : fractic: Letting Black invade the top after could endanger our two stones at the top right. I think this points strikes the best balance when it comes to defending the top. : kb: Time to live. : JG: White should try to stay connected, even though Black will probably push through and cut. : Hylebos: Surely the hane can't be too dangerous, right? : Holigor: The previous move by the black very much determines this reply. 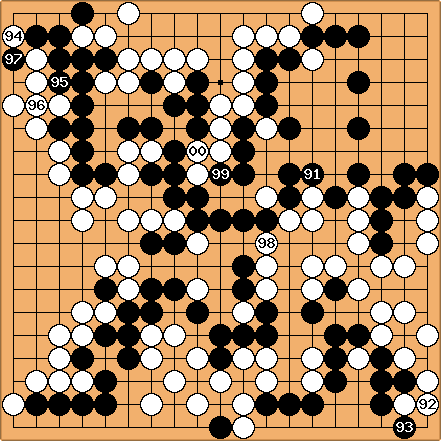 Black takes the corner and is ready to endure some kikashi. : JG The only move? : JoelR The only move. : Andy: I'm happy to get this easy white move. The next white move is going to require some thought. : Tapir: Grab the initiative? 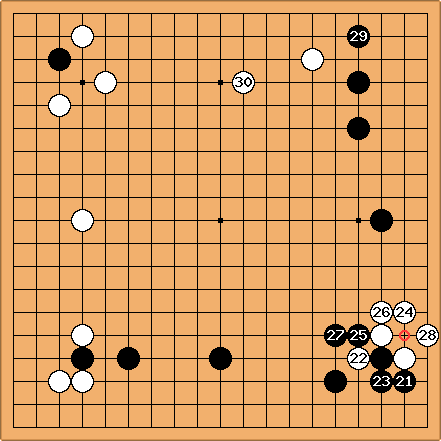 : fractic: I'm afraid this move is too heavy but letting Black capture at this point would remove pretty much all the aji in the corner. I just couldn't find a good alternative. : JG: Natural response to . It was hard to decide between this point and the nearby star point. : Holigor: On a boundary of two big spheres of influence. : ThorAvaTahr: Ouch that looks like a big corner. But let's just push down the other corner and see if white's high position still works well together. : JG: The boundary of two frameworks. Which side White should push out? : Andy: I think this keeps a good balance. : JoelR: There's still some aji in . Time to take the big point. : fractic: Let's play a probe here. : Herman: Cut first, think later. : fractic: I don't play the 3-3 point often. So for a change: . : JoelR: I do play the 3-5 point often. I'm curious how it interacts with the 3-3 point. : JG: This feels good after . : Is this tapir's move? : Andy: It looks like black's stones are going to slide off the right side of the board. : JoelR: Either Andy dared me to play on the left, or the right. I'm not sure. : fractic: This going to work well with .